Cashew Chicken stir fry is my latest experiment in the kitchen. I wanted to try a new chicken recipe and at the same time I wanted it to be spicy. 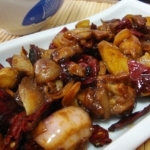 If you check for Cashew Chicken, you will find many recipes with oyster sauce. But for this recipe I didn’t use oyster sauce. Instead I used tomato sauce, chili sauce and soy sauce. Other than that I used chili powder, green chili and black pepper in small portions. 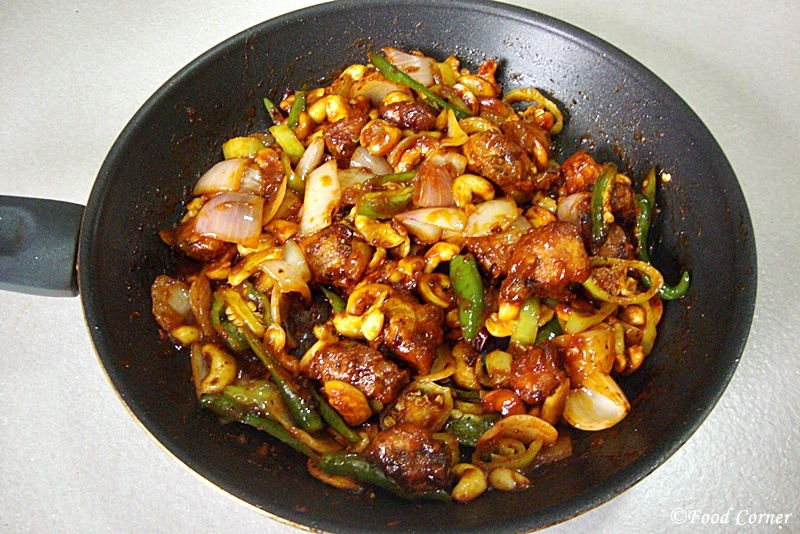 Combined all these peppers, finally cashew chicken is bit spicy, but really goes well with Sri Lankan taste. 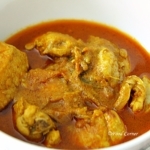 If you like Sri Lankan devilled chicken, you sure like this too. For better result, use freshly ground black pepper. 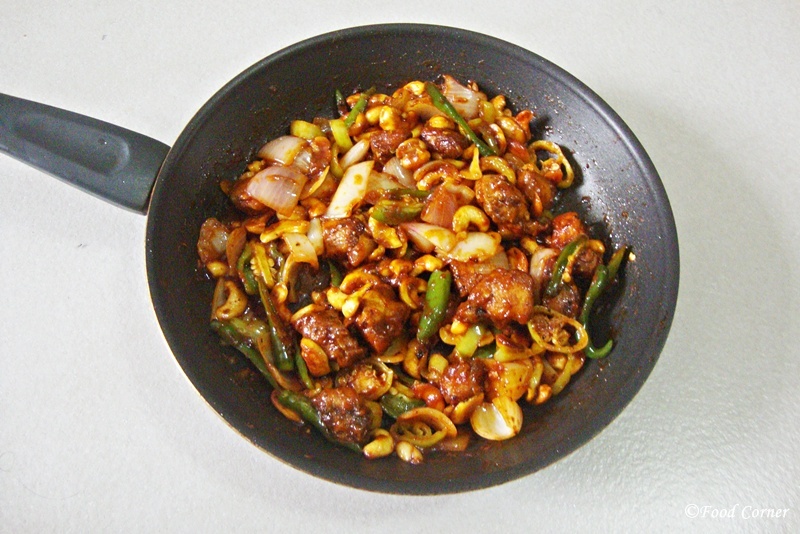 Finally this saucy chicken dish will gives you a bit crunchy taste because of cashew and at the same time spicy taste because of green chili and peppers. I cooked cashew chicken to eat with fried rice. Both were a really good meal together with a fresh salad. 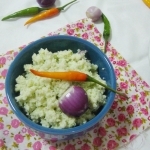 Have a look into the recipe and try it at home. Don’t forget to tell me the taste and how it turns out for you. Just one tip! Cashew nuts will get dark fast, therefore when you fry cashew, keep your eye on and use a low heat.Also,I usually like to prepare the sauce first in a separate bowl and add to the dish.In this way,I am able to check the taste of the sauce as it is the main deciding factor of the taste.But still you can add sauces directly into the dish from the bottle if you think you can manage the taste. 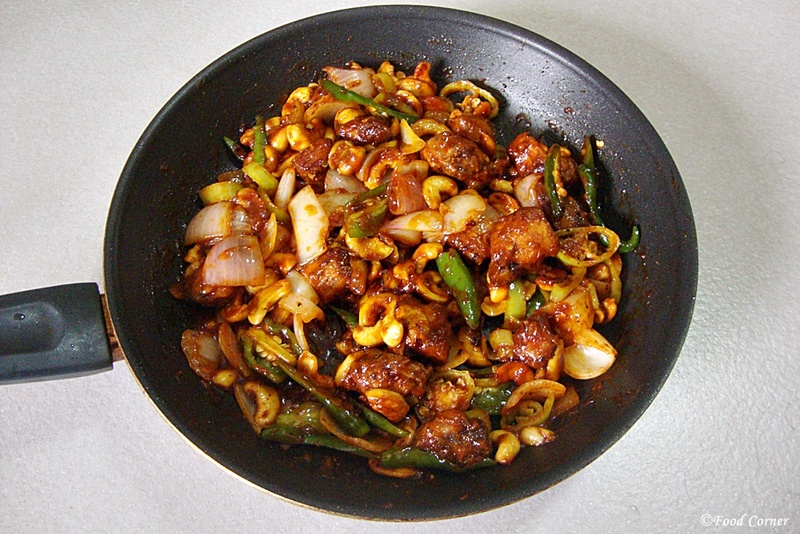 Here is the recipe for spicy cashew chicken stir fry.If you don’t like deep frying your chicken, you can try an even healthier method by picking a Weber grill and grilling it over high heat. Hope you will enjoy it. First wash, clean and cut chicken into bite size pieces. In a bowl, add all ingredients mentioned under marinade and make a paste. Mix chicken pieces with this paste, cover and keep aside for at least 20 minutes. At the same time, you can keep this inside the refrigerator too. Until chicken is marinating, prepare the other ingredients. Cut the onion into pieces. Slit green chili into lengthwise. Slice banana peppers if you use. Wash cashew and keep aside. In a bowl mix all ingredients/sauces mentioned under sauce. Prepare a smooth sauce by mixing well. Check the taste and adjust sauces as required. Step 3: Deep fry chicken. Heat oil in a wok and deep fry chicken. Step 4:Cook Cashew Chicken Stir fry. First, heat about 2 tbspn oil in a pan. You can use oil which we used for deep frying the chicken. When oil is hot, add cashew and stir fry. When cashew nuts turn bit golden, add onion & ginger garlic paste. Mix well till onion become tender. At this time add green chili and banana peppers. Finally add the sauce to the stir fry and mix well until all are combined well with the sauce. Cashew chicken stir fry is ready to serve. 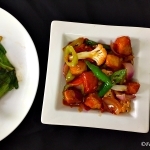 Check this video for steps on how to cook Cashew Chicken Stir Fry. 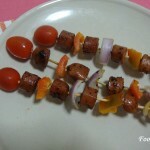 Its truly mouthwatering and spicy just to pamper the taste buds of people like me you love that spicy hit once in a while. Very well explained with notes like how to take care while frying the cashew nuts etc. very useful to replicate the same in the kitchen. And off course the clicks make the dish visually irresistible. Liked the video too. 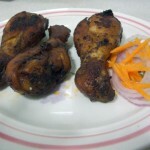 Thanks Piyali.Glad you liked the recipe and other details. Yes Gauri,Banana peppers make this dish more spicy and flavourful! This cashew chicken looks way too delicious!